Everything you love about embroidery, and everything you’ve ever dreamed of has come together in the amazing DreamMaker™ XE embroidery-only machine. 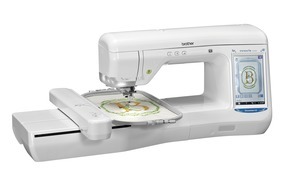 For those with a passion to embroider, the ultimate dream machine is here. Velocity up to 1,050 Stitches per Minute: The fastest Brother Series ever! Never worry about messy, unprofessional thread tails with the automatic cutter! With the simple push of a button, the thread trims automatically with a clean finish. The automatic thread cutter will eliminate any extra trimming of your jump stitches. Brother's New Premium Manufacturer's Warranty 25/6/2 Year! LCD Size (Horizontal x Vertical): 3.6" x 6.0"
Maximum Embroidery Area (X x Y): 7"x12"
The Viking Diamond Deluxe is a single needle sewing and embroidery combination machine made in China that costs the same as our 10 needle Brother PR1000E 14x14" embroidery only machine which is made in Taiwan. The Viking has only 10" of arm space to the right of the needle. The newer Brother VE2200 DreamMaker embroidery machine has 11.25" of arm space to the right of the needle, allowing for larger hoops. Viking's 10" arm space from left to right limits hoop movement to an effective 7" wide sewing field, so you have to split and mirror image any 14" wide imported design into 2 parts in their extra digitizing software before you can use their DESIGNER™ Majestic Hoop which measures 14 1/4” x 13 3/4”. V-Series Lineup Built-in Stitches and Designs Video See a Product Line up of all Machines in the new V Series from Brother: The Viking Diamond Deluxe is a single needle sewing and embroidery combination machine made in China that costs the same as our 10 needle Brother PR1000E 14x14" embroidery only machine which is made in Taiwan. The Viking has only 10" of arm space to the right of the needle. The newer Brother VE2200 DreamMaker embroidery machine has 11.25" of arm space to the right of the needle, allowing for larger hoops. Viking's 10" arm space from left to right limits hoop movement to an effective 7" wide sewing field, so you have to split and mirror image any 14" wide imported design into 2 parts in their extra digitizing software before you can use their DESIGNER™ Majestic Hoop which measures 14 1/4” x 13 3/4”.